The first time my husband and I ventured out for wine tasting in the Finger Lakes, we were both unaware of the wide variety of wineries in Cayuga County and around Cayuga Lake. We were also disorganized and didn’t take the time to find—let alone follow—a wine tasting trail map. Instead, we drove along the Cayuga Lake shoreline and stopped wherever we saw a sign for a winery. Many years, tastings, and bottles of New York State wines later, we’re better prepared, and we avail ourselves of the easily accessible wineries throughout Cayuga County and off the beaten path. And as we map out our own Cayuga County wine tasting trail, we also include the wonderful Finger Lakes restaurants that are nearby. 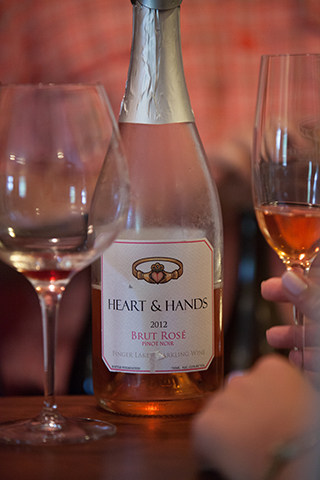 So, how do you make the most of wine tasting in Cayuga County? Making a weekend of it is a great way to start. This lets you visit some Cayuga County wineries on one day, and the remainder on another. It also allows you plenty of time to sit back, relax, and savor your experience—as well as a delicious meal or two—at any of the local restaurants and bistros that feature cuisine ranging from tapas to deli favorites, flatbreads to salads, and seafood to locally sourced burgers and steaks. For example, you could start the first day of your wine tasting adventure in Cayuga County by enjoying the rural scenery as you travel north to Colloca Estate Winery in Fair Haven. As you make your way south through Cayuga County, your journey could take you to Giancarelli Brothers Winery in Weedsport, where you’ll find a variety of high-quality Finger Lakes dessert wines. You can then head to CJS Vineyards & Aurelius Winery in Auburn, which specializes in Pinot Noir and Riesling. From there, travel south toward Cayuga and taste the wines at Izzo’s White Barn Winery and The Apple Station, then continue your journey to Heart & Hands Wine Company, which has been featured in Wine Spectator magazine and is located just outside of Union Springs. 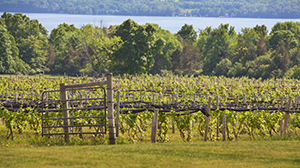 Resume your southbound wine tasting trail by heading to Aurora, where you’ll find a plethora of Finger Lakes wineries to please your palette, along with an almost endless variety of restaurants to tempt your taste buds. Among the wineries in Aurora are Long Point Winery—where you can sample medium to full-bodied wines and indulge in the deli favorites available at Amelia’s deli; Bet the Farm Winery—a regional wine shop and gourmet market; and Dill’s Run Vineyard, which boasts Rieslings and Chardonnays and also has a quaint bed and breakfast onsite. For your dining pleasure, Aurora restaurants include The Aurora Inn, The Fargo, and Dories, and just further south is Pumpkin Hill Bistro. And this makes a great finish to your first day of Cayuga County wine tasting, leaving you with more to explore on your second day. In fact, you can begin your second day visiting wineries in Cayuga County with a scenic trip to Locke, located in south eastern Cayuga County. There you can sample the wines at Chateau Dusseau Winery and Vineyard before heading northwest back to King Ferry and Treleaven by King Ferry Winery, producers of world-class Treleaven wines and smooth, full-bodied Chardonnays.